There's a lot happening at API. Whether it's new API offerings; API Leader, Board Members, and staff bringing AP to the forefront in the media; or Principle-related news from around the world, this is the place to check for the details on all API News. Taking applications for upcoming training workshops in Canada, Greece, and Argentina! "The lesson plans are meticulously organized, easy to follow and beautiful! I'm excited to present this information to parents." Learn more to take advantage of this rare opportunity to expand your knowledge base and join the growing community of Certified Attached at the Heart Parenting Educators. Attachment Parenting International condemns federal immigration policies that separate children from their parents at the U.S. border. API implores our leadership to prioritize the healthy attachment needs of all children and families, including immigrants, refugees and asylum seekers. We strongly reject any immigration policies that traumatize children and their parents. API's Principle of consistent and loving care for children means that we believe in the importance of children remaining with their primary caregivers, especially in times of great stress. Decades of attachment and trauma research have shown that forced separation causes extreme and long-lasting psychological distress. The encouraging work of Dr. Bruce Perry, expert on child trauma and Attachment Parenting International Advisory Board Member, goes prime time this Sunday! "If you have developmental trauma, the truth is you're going to be at risk for almost any kind of physical health, mental health, social health problem that you can think of," said Dr. Perry, interviewed by Oprah Winfrey for an upcoming episode of "60 Minutes." Dr. Perry is the founder of the ChildTrauma Academy in Houston. API is pleased about this attention to trauma-informed care, recognition of Dr. 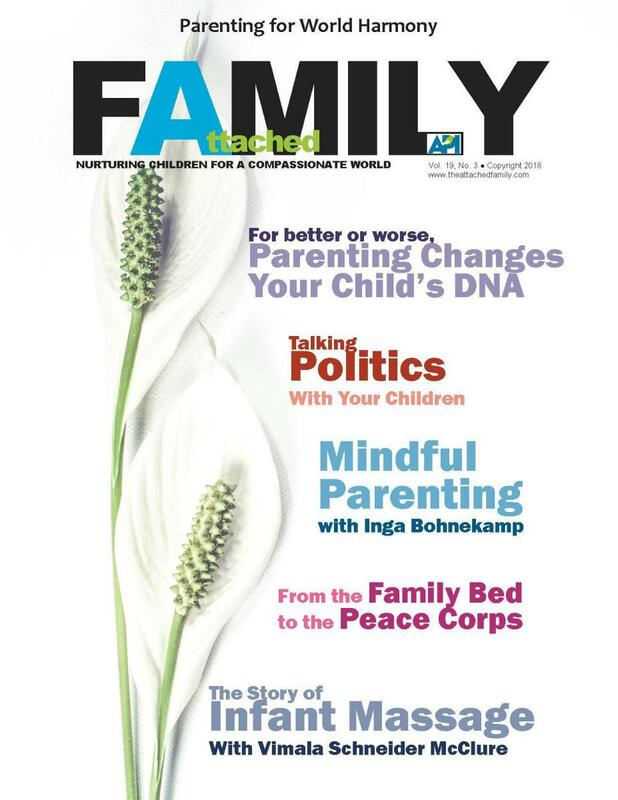 In this issue of Attached Family, we examine shame versus guilt and how shame contributes to emotional trauma. We look at the intersect of parenting and shame, keeping in mind that shame is a normal emotional response to certain social situations, but like anger or disappointment, when unresolved, shame can lead to lifelong difficulties. Nashville, TN. (October 26, 2016) – Attachment Parenting International (API) welcomes the AAP’s latest Statement on Infant Sleep that acknowledges the dilemma parents face in providing responsive nighttime infant care in accordance with past AAP guidelines. API's Online Auction is Open: Bid Today! How many good things can you accomplish at once? You get (and can give!) super deals on unique items. You share the love (by helping others get great gift deals) when you invite others to bid. You support parents everywhere because auction proceeds directly fund API parent support programs. Thank you for supporting API! 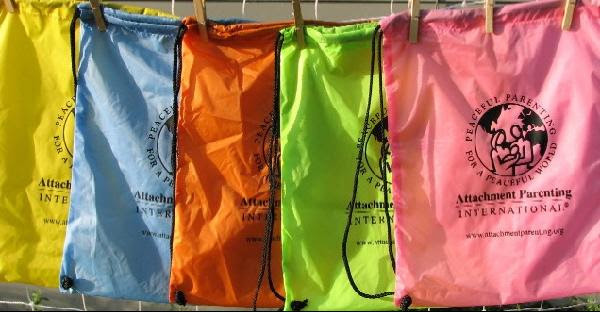 Similar to traditional prayer flags, the colorful API backpacks seem to be spreading peace, compassion, strength and wisdom on the wind in honor of our AP Month theme (above). Soak up plenty of daily AP Month peace and harmony as the AP Month celebration continues through October 31. 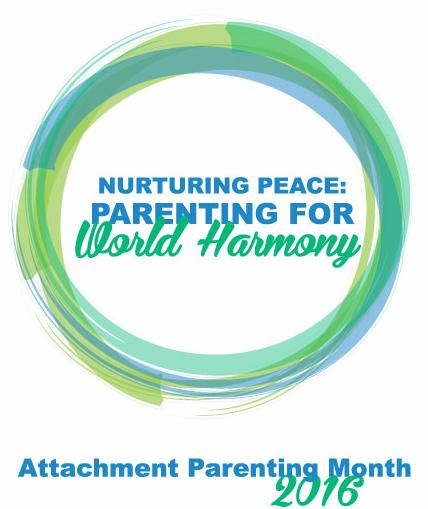 Nurturing Peace for World Harmony - AP Month 2016! As parents, we’re peacemakers by default. Sure, we all fall short sometimes: who of us isn’t tired, cranky, annoyed and just worn down at times? ARE YOU PASSIONATE ABOUT HELPING FAMILIES CREATE SECURE ATTACHMENTS? Based on the book Attached at the Heart, the Attached at the Heart Parenting Educator (AHPE) program is grounded in attachment theory, informed by cutting edge research, and designed as a prevention model to help parents better understand and apply the Eight Principles of Parenting for a child’s optimal physical and emotional development. 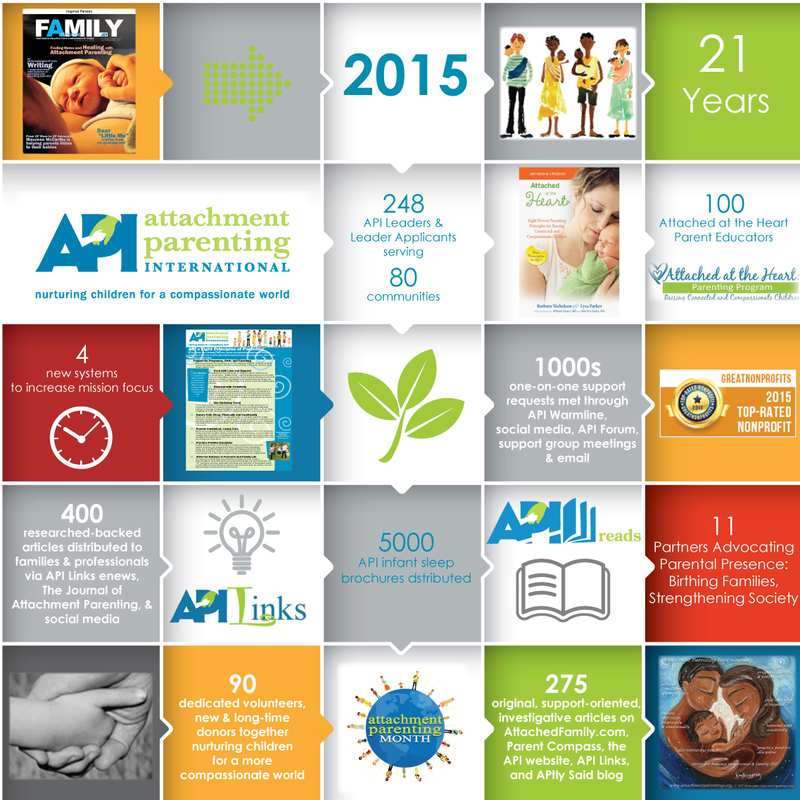 After celebrating API’s 20th year serving families and validating the impact of API, 2015 was a year to plan and ensure that API can continue our services and programs. API continued valuable programs such as accrediting leaders, distributing research-backed and investigative articles in timely publications, raising awareness about secure attachment, and helping individual families nurture for a more compassionate future. This is the core of API’s work. Families and services are grateful for your support and donations, and want you know how much you accomplished. "Big family is there and it's so important for the little ones to be around grandma, grandpa, cousins.... and easier on the mother :) During the time we spent in our village, Melek was always on someone's lap, shoulder... I thought she would forget to walk!! !